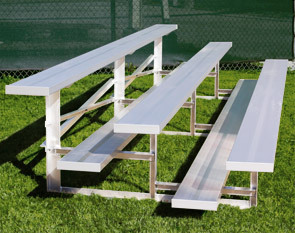 The Basic Bleacher Series offers portable bleacher seating for both indoor and outdoor venues. Featuring 10" seat plank and a compact space-saving design, this bleacher series is perfect for any sport. 6061-T6 aluminum alloy understructure construction features frames spaced at 6' centers joined by crossbracing at adequate points to comply with the design loads. Standard mill finish walking surface. Chemically cleaned aluminum welds. Galvanized hardware will not rust. Optional Tip and Roll kit allows to easily tip the bleachers into the upright position, and using the 5" non-marring swivel casters, simply roll the unit to its storage spot. 3 and 4 Row Units. Mud Sills (Wood Sleepers) Available.